This Friday will mark nine years since the bankruptcy laws were last changed. That law known as BAPCPA which stands for Bankruptcy Abuse Prevention and Consumer Protection Act was really designed to prevent those who have the ability to pay from getting out of their obligations under chapter 7 bankruptcy. The credit card companies lobbied Congress for years to get some reform in place. Congress was basically fooled into thinking that bankruptcy was actually being abused. Unfortunately, the Congress was really only hearing one side and that was the credit card lobby. They really didn’t take the time to learn all that was going on in the trenches or at least give as much weight on what they learned from the consumer bankruptcy bar association. So basically the new law was bought and paid for and finally passed on October 17, 2005. The real gem of the new law they believed was the means test. This mathematical test based on IRS guidelines for expenditures was going to determine who had the means to repay and who did not. If you had the means to repay, then chapter 7 fresh start bankruptcy was not going to be an option. You were going to be forced into a chapter 13 reorganization or you were not going to be permitted to file a bankruptcy case to change your financial situation. This means test at first was a scary thing. People were unsure as to whether or not they even file qualified for bankruptcy anymore. They were more confused about how much they could make, how much they were allowed to spend, how all of their secured assets such as homes and cars played a role in whether or not they could file and which attorney they could trust to get the right information. Well it turned out that only a small percentage of people looking to get out of debt were turned away from chapter 7. There were issues on family size, who constitutes as a dependent, whether the last six months qualifies or is this of breathing, moving thing going forward in terms of income. Well after nine years, we pretty much have the information that we were seeking at our fingertips. In that regard, the upcoming means test figures for Illinois were just released by the Justice Department. If you reside in the state of Illinois, you will be under the median for one earner family size if you are under $47,469. In a two-person family size, the median income is $61,443. A three-person household is $72,342. A four-person household is $83,546. For households exceeding four people you can add an additional $8100 for each individual above four residing in the home. As you can see from these upcoming figures, a person can make a decent amount of money and still qualify for chapter 7 bankruptcy. It almost takes me back to the beginning, before the law was reformed. Under the old system, the debtor would still have to submit his income, his expenses and report what he had made in the last three years. It was then up to a trustee or the United States Trustee or a creditor to argue that the filing was an abuse. And Trustees could have always claimed that the debtor’s income exceeded his expenses. The trustee or creditor could’ve argued that the expenses were inflated and thus there was money available to do a reorganization and that the chapter 7 should be dismissed. The means test took away that ability in essence from the Trustee and the United States Trustee. Now the real issue is whether or not that person qualifies for bankruptcy and passes the means test. Now please recall that these figures that I just gave are the median family size in the state of Illinois after November 1, 2014. 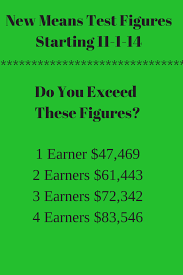 A person can be over these figures and still pass the means test. It is now the United States Trustee’s duty to look at a debtor who is over the median and determine whether or not the means test is completed properly to the point where one can determine whether or not that debtor is eligible for chapter 7 or not. As the median income figures continue to rise, there will be less and less debtors who are caught in the gauntlet of the means test and prohibited from filing chapter 7. This is indeed very good news for debtors in the state of Illinois. If you are concerned about whether or not you qualify for bankruptcy based on your income and the new means test figures, you can contact my office at 847-520-8100. You will receive expert advice from Chicago’s premier bankruptcy law firm.